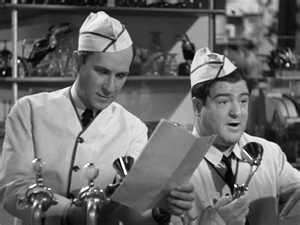 In one of their best films, Bud Abbott and Lou Costello play Chick and Mervyn, a couple of soda jerks who aspire to be radio mystery writers. They catch a break when they're given tickets to watch a recording of Murder at Midnight, a popular series produced in the General Broadcasting Company (GBC) building across the street. Of course, Mervyn (Costello) loses the tickets in a obvious scam and the boys end up sneaking into the recording studio. Thus, they're practically on the set when the show begins...and the network's president is electrocuted. Chick and Mervyn start to go for the police, but quickly decide to play detective themselves. They figure that if they can solve the murder, their new-found fame will secure their employment as mystery writers. When Mervyn comes into possession of a vital clue, he and Chick become pursued by the killer. To make matters worse for the boys, the real detectives (William Gargan and William Bendix) show up and they're not happy about being impersonated. 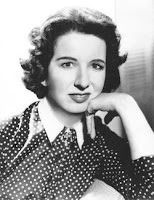 The standouts in the supporting cast are two comic pros: Mary Wickes and William Bendix. The former plays the network president's secretary and the object of Lou's affection. Bendix, as one of the detectives, plays straight man to Costello in most of his scenes. It couldn't have been easy playing second banana to Lou, whose style of comedy demands that the camera focus on him. But Wickes and Bendix were consummate performers who knew how to complement their fellow actors. It was a skill that kept them in demand throughout their careers in film, radio (for Bendix), and television. Chick and Mervyn at the diner. My only complaint with Who Done It? is that it doesn't take maximum advantage of its setting and plot. The radio series backdrop contributes to a few laughs, but whole sequences take place outside the GBC building (e.g., a big scene where Mervyn learns he has won $10,000 in a radio contest). Likewise, the central mystery--which involves spies sending secret messages--could have been integrated into the hijinks better. Yes, this is an Abbott and Costello comedy, but consider how the plot contributed to their classic farce Abbott and Costello Meet Frankenstein. Still, you don't watch Bud and Lou movies for meaningful stories--you watch them to laugh. And there are more than enough gags in Who Done It? to satisfy the duo's fans...and maybe even convert some new ones. Haha – you're right. 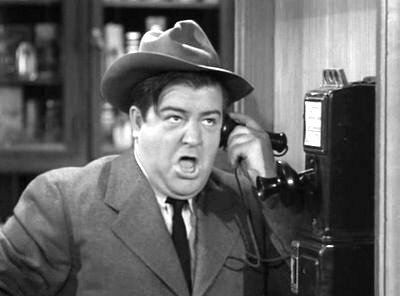 A person doesn't watch Abbott & Costello for Meaning and Depth. This is one I haven't seen, and if Mary Wickes is in it, I'll have to track it down ASAP. I remember watching this as a kid and thinking Costello had a good throwing arm tossing rocks(?) and knocking out lights on the neon sign atop the building, spelling out "help" and the end of the movie. I thought the spelling out of "help" was pretty clever. This certainly is one of A/C's best. For years, "Hold that Ghost" was my top pick but lately "Who Done It" has gone to the top of the list. I found it interesting that William Bendix was put into the film as a comic detective, considering the film starred two comedians...I would have thought they may have resented that. But for this picture, having a dumb detective thrown in the mix works well. HOLD THAT GHOST is another A&C classic and the "moving candle" must be one of their most famous routines.